Für diese Groblokalisierung sprechen viele weitere Einzelheiten, von der Erwähnung von Pflanzen, Früchten und Gärten bis hin zu der durch­gängi­gen Bezeichnung der Christen als na??r? im Koran (Nazarener, Naso­räer?). In einer Inschrift des zoroastrischen Priesters Kartir (letztes Viertel des 3. Jahrhunderts n.Chr.) wird „unter den damals im westiranischen Bereich ansässigen Christen … zwischen griechisch-sprechenden (krestyane) und syrisch-sprechenden (nasraye) Gemeinden“ unterschieden. Diese (Selbst-?) Bezeichnung der syrischen Christen als nasraye, im Koran na? ?r?, im Unterschied zu den griechischen Christen (krestyane, von griechisch christianoi), scheint im Umfeld des Koran die vorherrschende Namens­gebung gewesen zu sein. Griechisch und syrisch sprechenden Gemeinden wurde auf der Synode von 410 in Seleukia-Ktesiphon zu einer großen ost­syrischen Kirche vereinigt, so dass es z.Zt. der Entstehung des Koran, vor allem im Osten, wohl vorwiegend das Christentum der na??r? gab. Als einer der ersten Autoren, der auf die Invasion der Araber reagiert hat und überliefert ist, beschreibt Maximus der Bekenner (580-662) die Ge-schehnisse von Alexandria aus in einem Brief an Petros Illustrios, verfasst zwischen 634 und 640, und sieht in den Ereignissen ein Zeichen Gottes und die Bestrafung der Christenheit für die begangenen Sünden: And especially when […] nature herself teaches us to take refuge in God, when she uses the present dire circumstances as a symbol. For what could be more dire than the present evils now encompassing the civilized world? […] To see a barbarous nation of the desert overrun-ning another land as if it were their own! To see our civilization [politeia] laid waste by wild and untamed beasts who have merely the shape of a human form! […] For we have not conducted ourselves in a manner worthy of the Gospel of Christ […] We have all acted like wild beasts towards another, ignorant of the grace of God`s love for humans, and the mystery of the sufferings of the God who became flesh for our sakes. Im Jahre 128 (745/746) wurden in Merw Silbermünzen mit der Aufschrift „Āl Kirmānī ibn ʿAlī” geprägt. Dies sind die „Leute aus Kirmān vom ʿAlī” oder „die ʿAlī-Anhänger aus Kirmān”. Die Prägung fällt in die unruhige Zeit nach dem Tode Hišāms (TL 724-743). Münzen dieses Typs wurden erstmals im Jahre 127 (744/745) im Gebiet von Isfahan (Jayy) geprägt, 128 auch in anderen Städten des iranischen Hochlandes und Khuzistans: al-Taymara, al-Rayy, Rām-Hurmuz und Istakr. Popp deutet dies als Spuren eines Aufstandes, der mit der Besetzung von Merw einen Höhepunkt erreichte. „Ich sage, Ajakide, du kannst die Römer besiegen.“[WQ] – Annalium VI, 174; Worte der delphischen Phythia zu Pyrrhus vor dem Pyrrhischen Krieg 280-275 v.Chr. Similarly, the use of the term „the religion of Muslim, the enemies of God,“ „the detestable doctrine of … Mohammed,““ the faith of Islam, “ and “ these idolators,“ all together and referring to the same religion, cannot be late 7th century. ،The terms Muslim and „Islam“ were not yet used by the Arabs themselves, let alone by onlookers. As stated “ the faith of Islam“ cannot be John’s since the use as a name for the religion had not yet been introduced by the Arabs themselves. The term “ Muslim“ must also be a resultat of the Arabic translation. نه فقط مترجمان قرون وسطا بلکه گژوهشگران مدرن نیز از این شیوه ترجمه قرون وسطای استفاده می کنند . so that it make as much sense to read the word as an epithet, “ the one chosen/desired (by God), as to read it as a name. „Muhammad“ is not linked here to a particular man, with a family, birthplace, triebe, etc. these considerations, then, date this surah to any time from the early 2nd/8th century on. صفت هستند و فقط آیه 33،40 : (محمد پدر هيچ يك از مردان شما نيست ولى فرستاده خدا و خاتم پيامبران است و خدا همواره بر هر چيزى داناست ) به محمد به عنوان پیغمبر اشاره می کند. so that it makeas much sense to read the word as anepithet, “ the one chosen/desired (by God), as to read it as a name. 1 – we interpret Muhammad’s anonymity as a sign that that three of the four reference to him entered the scriptural material before the Prophet had been provided with a biography, and very probably before the term Muhammad hat been interpreted as the prophet’s name; the fourth reference we consider to be more probably a later addition. Again, „Muhammad“ is not linked here to a particular man, with a family, birthplace, triebe, etc. The word could equally well be an attribute: “ the desired/ Chosen One“ – i.e., he whom God desired as His messenger. ; and the other, , immediately following it, which was introduced on coins in 71 A.H.: Muhammad rasul Allah: Muhammad is the Messenger of God ( Q.48:29). and those with him are hard against the unbelieversand love each other (Q.48:29). we see this , too, as an official pronouncement regarding the behavior expected of believers: to love other believers and act with intransigence against unbelievers. This attitude was not typical of the official faith before al – Walid, as we shall see in the next chapter. these considerations, then, date this surah to any time from the early 2nd/8th century on. The date on the coin was written in Pehlavi, and we are not competent to offer an opinion regarding its transcription or translation as 66. But assuming that the reading is accurate, we consider that for the reason given above,, the era mus be Y.E., corresponding to 78 A.H.. This date accords much better with the history of the area in 60s -70s A.H., and with all the other evidence, numismatic and epigraphic, pointing to ca. 70 as the date of adoption of Mohammadanismus by the ruler(s) of the Arab polity. One other coin bear a problematic date ( and it too , as it happens, was minted at Bisapur). It was issued by the Umayyad governor Ubaydullah bn Ziyad ( gov. 53 -76 A.H. and is dated 53. Since Ibn Ziyad held office for a long time this could be either 53 A.H. or 53 Y.E. = 65 A.H.. We consider it to be almost certainly from 53 A.H. Firstly, this s in the “ main sequence of Sufyani coins, whereas no other Sufyani coins at all were minted by any governor in this entire area after 64 A.H., so that the date of Y.E. 53/65 A.H. is inherently most unlikely. Even more to the point, although Ubavdullah was officially governor till his death in 67 A.H., he was in fact driven out of the province of Iraq into Syria by popular opposition in 64 A.H., after the death of caliph Yazid. It is therefore very problematic to date a coin issued by him to 65 A.H.
O God, bless him in his affairs, strengthen his rule as You see fit and cheer him himself and his entourage, amīn. Saʿd Abu ʿUthmān undertook the building of it, and ʿAbd al-Raḥmān wrote [this] in Ṣafar of the year sixty-nine. Non of the elements listed above occurs in Arab monotheistic inscription of the Sufyani period. From the prior to 71 A.H. we possess religious texts , such as supplications, and commemorative texts with some religious content, such as Muawiyah’s dam inscription near Ta’if of 58 A.H. This bridge was commissioned by the governor ʿAbd al-ʿAzīz ibn Marwān. O God, bless him in his affairs, strengthen his rule as You see fit and cheer him himself and his entourage, amīn. Saʿd Abu ʿUthmān undertook the building of it, and ʿAbd al-Raḥmān wrote [this] in Ṣafar of the year sixty-nine. The absence of any religious element, not even a Hijri date, make it likely that this inscription has been accurately transmitted. The Official Faith it almost certainly did not have then the meaning it later acquired, i.e. , as an official term for the Arabs religion. The term „Muslim“ is later still: it does not appear in any pre-Abbasid Arabic texts, including official inscriptions, popular graffiti, coins, and protocols. That the Messiah is of David descent, everyone professes, the Jew, the Mahgraye and the Christians….the Mahgraye too, though they do not wish to say that this true Messiah, who came and is acknowledged by the Christians, is God and the Son of God, they nevertheless confess firmly that he is the true Messiah who was to come….. [O]n this they have no dispute with us, but rather with the Jews …. [But] they do not assent to call the Messiah God or Son of God. The phrase “ the detestable doctrine of… Mohammed“ mayvery possibly be in the original , since at the time of writing , Muhammad hat already been proclaimed in the Dome of the Rock. 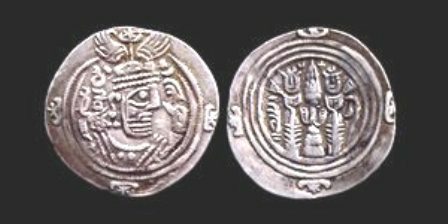 The sassanian monarchs dated their coins from the year of their succession, not by reference to an external era; Xusrau’s own issues therefore bear dates from 1 to 39. The Arab imitations of Xusrau’s coins , which still bear his name, are dated from 21 to 50, and it is not always clear to which era the date refers. in same cases the date could still be either A.H. or Y.E., or even , occasionally, P.Y.E. It is probable that Muwiyah was not responsible for the conquest of Egypt Although the only undoubtedly historical competitor for supremacy whose name we know is Ali, there must have been many others, one of whom could have diverted his attention to Egypt, perhaps on seeing his chances of success in al-Sam diminishingSince he won the contest, we do not know who most of the others were. The only contender for supremacy against Muawiyah of whom we have reliable knowledge is Ali, whom Muawiyah fought at the Battle of Siffin ( 36/657 ). The Muslim traditions provide a wealth of names, both of the caliphs before Muawiyah, and of field commanders. But the historicity of the four first caliphs is highly suspect, and the commanders are placed within an impossible historical framework – the unified conquest commanded from the Hijaz – so that we can make little history out of the occurrence of name in the Muslim sources. It is likely the tales of the Riddah campaigns are back-projections of events that occurred in the period leading up to Siffin. من بعید می دانم که مسلمانان در قرون وسطا دست به یهودکشی زدند، برعکس اروپائیان ( اسپانیا ). به اخبار از مزدکیان باید با احتیاط رجوع کرد: آرتور کریستین سن مورخ دانمارکی اشاره می کند : ” عده حقیقی مزدکیان که در دام افتادند و به قتل رسیدند معلوم نیست. اعدادی که مورخان ایرانی و عرب آورده اند ، مبنای درستی ندارند…” ( آرتور کریستین سن: ایران در زمان ساسانیان، تهران ۱۳۸۴، ص. ۳۵۶ ) کریستین سن ادامه می دهد : ” اما راجع به شخص مزدک اطلاعات ما کم است. ص. ۳۳۷ “. نه فقط در مورد تعداد مزدکیان کشته شده و شخص مزدک ، بلکه بطور کلی، اطلاعات ما در باره جنبش مزدکیان، که در زمان سلطنت قباد اتفاق افتاده است، کم است. مورخان غربی قرن ۶ ( Yosue , Malalas ) که از حوادث ایران در دوره قباد خبر داده اند به جنبش مزدک اشاره ای نکرده اند ( Otakar Klima: Beiträge zur Geschichte des Mazdakismus ص. 16- 21 ) .Klima ادامه می دهد که : در واقع می بایست عجیب به نظر برسد که حدود ۴ قرن به اسم مزدک اشاره نشده است ( Klima ص. ۱۶). نویسنده یونانی Prokopios ، که از سال 527 در دربار بیزانس بسر می برد و دو جلد کتاب در باره جنگ ایران و روم به تحریر در آورده است ، از اعمال خود سرانه قباد یاد کرده است، اما به مزدکیان و قتل عام این گروه اشاره ای نکرده است ( Klima ص. ۳۲ ). از جنبش مزدک تاریخ نویس ایرانی ، طبری ، ( که در قرن ۹و 10 تاریخ ساسانیان و اعراب را به زیان عربی نوشته است ) و دینکرت ” درسنامهٔ دین مزدایی قرن ۹ – به زبان فارسی میآنه “ و هم چنین فردوسی در شاهنامه خبر داده اند. این اخبار 400 سال بعد از جنبش مزدک و بدون ارائه سندی معتبر نقل شده اند. فردوسی نه به زبان عربی ، نه به زیان پهلوی تسلط داشت و به طور قطع موبدان زرتشتی در خراسان روی داد جنبش مزدک را برای این منظومه سرا تعریف کرده اند. دو استاد تاریخ معاصر آلمانی ، Winter و Wiesehöfer نیز اشاره می کنند، که به علت نبودن اسناد کافی، امکان بازگو کردن جنبش مزدک وجود ندارد.
. جنبش عباسیان که از شرق شروع شد بیشتر تحت نفوذ ایرانی ها بود تا اعراب و به همین علت عباسیان تلاش کردند مشروعیت تاریخی خود را نزد اعراب جستجو کنند، اما منشا تاریخ نگاری اعراب در ایران بود : تاریح طبری . دوران بندی تاریخ بر حسب دوره و زمان که در تاریخ طبری مشاهده می شود یک جهانبینی ایرانی است. طبری در تاریخ خود به چهار خلیفه اول اسلام اشاره می کند ، به ابوبکر، عمر؛ عثمان و علی . برای این تاریخ نویس ایرانی این چهار خلیفه خلیفه های تاریخ رستگاری بودند و نه خلیفه های تاریخی ( حقیقی ). فقط تاریخ شناسان اسلامی به این چهار خلیفه اشاره کردند، برای تاریخ شناسان مسحیی قرن 7 این چهار خلیفه ناشناس بودند، از این چهار خلیفه نیر سکه ، یا سنگ نبشته ای نیز پیدا نشده . مادر ابوبکر باکره بود بکر (b-k-r) به معنی زود برخاستن، زود آمدن است و بیکر ( bikira) معنی فرزند اول، یا بکره را می دهد، پسر اول رابطه بخصوصی با خدا دارد. به نقل از ابن هشام ابوبکر مبلغ موفق مذهبی و تاجر خوش نامی بود. چهار خلیفه برای طبری به علت مهم بودند که ایرانیان از عدد چهار برای تقسیم بندی- و نظم جهان استفاده می کردند. عدد چهار چهار جهت جغرافیایی ( شمال، جنوب، شرق و غرب ) را نشان می دهد و همچنین چهار اشاره ای است به چهار عنصر آتش ، زمین (خاک )، آب و هوا . داستان آفرینش نیز از چهار فرشته نام می برد : جبرئیل، میکائل، اسرفیل و اوریئل. چهار در مسجد قبه صخره در اروشلیم به طرف چهار جهت جغرافیای باز می شوند. “ در سال 661 معاویه به قدرت رسید “ ، چون تنها سند تاریخی از این دوران که ما در دست داریم فرمانروایی معاویه است. تمام اتفاقاتی که قبل از معاویه شرح داده شد ، چه کامل، یا چه مختصر ساختگی هستند. علی از سوی خداوند به ولایت و سرپرستی امت منصوب شده است همان گونه آنگاه که گفته می شود „محمد رسول الله“ است یعنی محمد (ص) رسولی از جانب خداوند است. سوفرونیوس ( 560 – 638) کشیش اروشلیم از سال 634 تا 638 در نامه ای خبر می دهد که ما به علت گناه ها و اعمال خلاف نمی توانیم این اوضاع را درک کنیم. امسال ما نمی توانیم مراسم کریسمس را در بیت لحم برگزار کنیم. اعراب (Saracens. ) مسیر اروشلیم تا بیت لحم را نا امن کردند. سوفرونیوس نه اسمی از اسلام می برد و نه اشاره می کند که اعراب بیت لحم را اشغال کردند. We, however, because of our innumerable sins and serious misdemeanours, are unable to see these things, and are prevented from entering Bethlehem by way of the road. Unwillingly, indeed, contrary to our wishes, we are required to stay at home, not bound closely by bodily bonds, but bound by fear of the Saracens. سلام شناسان سنتی ادعا می کنند که خوارح اولین فرقه مذهبی در دین اسلام بودند. در جنگ صفین، به نقل از این اسلام شناسان، علی پیشنهاد کرد که خلیفه را داوران تعیین کنند (تعیین خلیفه به حکمیت ). بخشی از جنگجویان که با این پیشنهاد حکمیت موافق نبودند به عنوان اعتراض لشگر علی را ترک کردند و در دهکده ای به نام حروراء ( Harura ) در نزدیکی کوفه ساکن شدند. این گروه که لشگر علی را ترک کردند به خوارج ( آنهایی که به حروراء رفتند ) معروف شدند.